Dream Pod 9: NuCoal Plastic Model Sprues Preview Shown To Scale! The NuCoal model sprues have finally been finished up for the Chasseur, Cuirassier, Jerboa, Chevalier plastic miniatures. 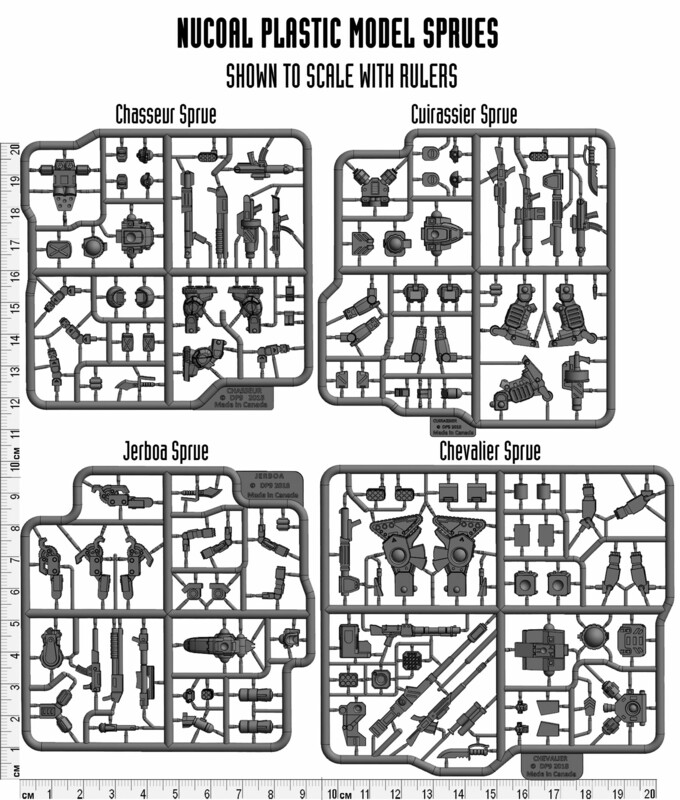 Checkout the preview image shown below (click the image to see a larger version) with all four model sprues shown to scale and with rulers in millimeters (mm). We fit all of the models stock and variant weapon parts on the sprues, along with extra pose lower arms and legs in most cases. Plus extra parts like hand grenades, ammo clip, and boxes to add around the hips like our original pewter models have. And like all our newer models they have ball sockets to connect the torso to the shoulders and hips for a wide variety of poses. Plus the lower arms are separate parts that can be rotated in or away from the torso and glued in the position you like. Checkout the full update on our Kickstarter page which includes a link to downloadable 3d PDF of the Jerboa model parts sprue which you can zoom in on, rotate, and see all the details up close. Here is a link to the Kickstarter update page. Our modeler is now working on the Utopia model sprues and once finished we'll do a preview in the Utopia Kickstarter and be able to get production started on all the plastic injection molds. Home › Blogs › Robert Dubois's blog › NuCoal Plastic Model Sprues Preview Shown To Scale!